The exclusion of the word “international” in the affirmation, like the moderation of most of the text, was the result of efforts by Prime Minister Ranil Wickremesinghe. On Monday morning he brought up the issue with British High Commissioner James Dauris at a meeting in ‘Temple Trees’. Later on Tuesday, he had a conference call with Atul Keshap, the US Ambassador to Sri Lanka, who was then in Geneva. Also linked to the conference call were Foreign Minister Samaraweera (who was then in Colombo) and High Commissioner Dauris. The main thrust was to exclude references to the use of the word “international” in describing the investigative mechanism. As for the use of the word “foreign,” highly placed Government sources argued, there were precedents. When this played out, TNA’s M.A. Sumanthiran flew to New York for a meeting with Michele J. Sison, US deputy envoy to the UN (and former Sri Lanka Ambassador). She is number two to Ambassador Samantha Power. Those interactions sealed the deal over a final resolution. The word “international,” was replaced by “foreign” paving the way for the inclusion of mostly Commonwealth judges and others. There was strong criticism over how the judiciary functioned under the Mahinda Rajapaksa administration. This was over appointments of some judges for purely political reasons, their controversial public conduct and questionable or allegedly biased rulings. As revealed in our front page report today, it has already been decided to initiate impeachment proceedings against a Supreme Court Judge for what is being described as proven misbehaviour if a courts case he is now facing finds him guilty. The Constitution makes provision for impeachment of judges after the President has made an address to Parliament, supported by the majority of the total number of MPs. Another judge has come under investigation after allegations that the spouse ran a consulting firm. This firm, it is alleged, had direct involvement with the functions of the judge concerned. “We will verify the accuracy of all the allegations and then take appropriate action,” a high ranking Government source said yesterday. “We are determined to clean and shore up the professional image of our judiciary,” the source added. This will be done through legally prescribed means to make clear there are no political motives, the source added. The Cabinet team, besides Sirisena, includes Prime Minister Ranil Wickremesinghe, Kabir Hashim, Duminda Dissanayake, Champika Ranawaka, Nimal Siripala de Silva, Lakshman Kiriella, Rajitha Senaratne, Malik Samarawickrema and S.B. Dissanayake. Last Tuesday, this Committee invited Janatha Vimukthi Peramuna (JVP) leader Anura Kumara Dissanayake to discuss issues related to bribery and corruption. The US resolution has welcomed the establishment of the Commission to investigate allegations of bribery, corruption, fraud and abuses of power, and stressed the importance of such investigations and the prosecution of those responsible in ending impunity and promoting good governance. The JVP leader was a member of the apex Committee which oversaw anti-corruption operations in the “National Government” which President Sirisena set up after he was voted to office at the January election. Sirisena told JVP leader Dissanayake that the Government was planning to conduct intensive probes on some ten high profile cases of corrupt activity and related matters. These include the Avant Garde floating armoury case and the one on RADA (Reconstruction and Development Agency) which was tasked to build houses in the north after the tsunami of December 2004. None had been built though millions of rupees were claimed. Sirisena said that on his return from New York on October 3, he would summon a meeting of top officials including Police and brief them on the need to pursue these and other investigations. In a statement to Parliament on Tuesday, Dissanayake alleged that among the bank accounts Avant Garde held was one in which the company held Rs. 30 billion. Most of these cases, a Government source said yesterday, related to former President Mahinda Rajapaksa or members of his family. Rajapaksa also came in for severe criticism at Wednesday morning’s weekly ministerial meeting. It had been re-scheduled from 7 p.m. that night to 9.30 a.m. in view of Sirisena’s then impending departure to the US in the early hours of Thursday. “Mey ratey Janadipathivaru dennek inna beha. Ey vagey deval wena eka navaththanna oney” (there cannot be two Presidents in the country. Such things have to be stopped), Sirisena remarked on reports that the Army, Navy and Police had placed a heavy security cordon around a tourist resort in Pasikudah where Rajapaksa and his family were holidaying. Photographs of Rajapaksa, in swimming trunks and safety jackets riding water scooters with a security officer seated behind or snorkelling went viral in some websites. There were also similar photographs of his sons Namal (Hambantota District MP) and Yoshitha (a Navy officer). The President said he just could not understand why such heavy security was needed since Rajapaksa was now only an MP and the threat level was not as high. He said when Rajapaksa was President, there was a fleet of 1,400 vehicles. It has now been drastically reduced. Sirisena pointed out that Rajapaksa was now using some 240 security personnel. “After I finish my tenure in office, I don’t want to go looking for official bungalows. I will go to Polonnaruwa and live in my house,” he said. 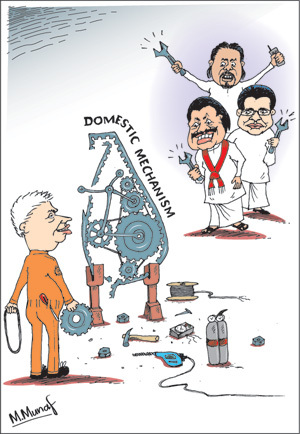 He pointed out that Rajapaksa had more vehicles for use than him as President. Yet, he was asking for more. Even as he made those remarks this week, some of the Presidential Secretariat vehicles which had earlier been reported missing were being returned, some by former MPs. An angry Sirisena then directed Finance Minister Ravi Karunanayake to submit a report to the next meeting of the Cabinet of Ministers on the costs to the taxpayer to sustain Rajapaksa’s security, his support staff and related activity. Thereafter, he is to obtain a fresh threat assessment and call upon the National Security Council to decide on the form of security that should be afforded to Rajapaksa both as a former President and now MP. Sirisena was also angry that one or more ministers in his team had leaked to the media moves by him to have them sign a document to adhere to “collective responsibility.” Eyagollo thamange harda shaakshiyata viruddava vedakaranawa or they are working against their own conscience, he remarked. He said he has had many calls from persons asking him why such a matter has been publicised. He added that ministers should forward to him a report every month giving an account of what they had accomplished in accordance with the five-year plan that is being envisaged. Ministers approved 17 different cabinet memoranda including a Memorandum of Understanding with the United Arab Emirates (UAE) to set up a Joint Committee for Consular Affairs. Another was approval for the construction of houses for the resettlement of families affected by the separatist war. Q: There is mention about a Hybrid Court in the OHCHR report to investigate alleged war crimes. What is the position? A: There is nothing like that. You were the ones who have started something like that. There is no name like that. Q: No Minister! UN High Commissioner’s announcement clearly referred to “hybrid special courts.” There is no need for you to accuse the media over it. A: No, I did not accuse you. I said that it was not a word which I or the UN said. Q: It was indeed referred to by the UN. In fact it is in the headline of the summary it sent. A: Now, this is only a proposal by the Human Rights Commissioner. This is not the end. That report is now with the UNHRC and it will make the final decision. There is no reference to the word ‘hybrid’ in that. They have proposed a domestic inquiry in the US resolution. A majority of countries have agreed to this. Some countries are still opposing. So, I don’t see any ‘hybrid story’ here but a domestic inquiry. They may request us to have foreign technical advice. Even Mahinda Rajapaksa did that. It is in this backdrop that four key elements have been included in the final US resolution with the concurrence of Sri Lanka for “Commonwealth and other foreign judges, defence lawyers, authorised prosecutors and investigators.” The first draft did not include defence lawyers. From New York, Samaraweera said in a statement on Friday: “We are confident that Sri Lanka has the capacity, expertise and the commitment to implement the provisions of the resolution over a period of time, step by step, taking appropriate action that will ultimately vindicate that our nation and her people are at peace, assuming its rightful place among the community of nations.” He added that the “international community recognises” what he called the “reality that the reputation of the vast majority of the armed forces was tainted in the recent past because of the system and culture created by a few in positions of responsibility.” It is quite clear that the thrust of the upcoming probes will focus more on those responsible for orders to the armed forces. Prime Minister Ranil Wickremesinghe is to meet military and Police top brass, beginning today, to explain the varied aspects of the OISL report and the Government’s planned actions. “The UN human rights chief flagged the need for ‘political courage and leadership’ to tackle ‘deep-seated and institutionalized impunity,’ which risks future violations. ‘Institutionalized impunity’ has been allowed to fester for decades, he said, and the only way to effectively try past abuses in a highly politicized environment like Sri Lanka is to integrate international judges, prosecutors, lawyers, and investigators into a hybrid court – merging domestic and overseas expertise. On Wednesday evening, the Foreign Ministry in Colombo sent instructions to Ambassador Aryasinha asking him not to formulate his own media statements and deliver them to the media in Colombo and elsewhere directly from Geneva. More so, when he takes part in informal events. The directive made clear that such material should be forwarded to the Ministry of Foreign Affairs which would determine whether it should be released for publication or broadcast. Aryasinha has remained Sri Lanka’s PR since the Rajapaksa administration and was earlier a vociferous critic of the US and her allies. Welcoming the US-Sri Lanka joint resolution to be introduced on Wednesday Sept 30, the Tamil National Alliance (TNA) said in a statement that “in particular, we welcome the draft resolution’s call on Sri Lanka to involve foreign and Commonwealth judges, lawyers, investigators and defenders in a judicial mechanism to be set up in Sri Lanka that would be mandated to try international crimes. This constitutes a significant victory for justice in Sri Lanka. The TNA is committed to help the government and international stakeholders evolve such a court, and will support its work. We also wish to note our appreciation of the government’s assent to this text and its willingness to co-sponsor it in the Human Rights Council. Recognising that a credible accountability process for those most responsible for violations and abuses will safeguard the reputation of those, including within the military, who conducted themselves in an appropriate manner with honour and professionalism. Recalling the responsibility of States to comply with their relevant obligations to prosecute those responsible for gross violations of human rights and serious violations of international humanitarian law constituting crimes under international law, with a view to ending impunity. Here are some of the more important operative paragraphs in the final US resolution that will be supported concurrently by Sri Lanka on Wednesday at the Human Rights Council sessions in Geneva. Encourages the Office of the High Commissioner and relevant special procedures mandate holders to provide, in consultation with and with the concurrence of the Government of Sri Lanka, advice and technical assistance on implementing the abovementioned steps. With Sri Lanka now becoming a co-sponsor of what would be a unanimous resolution at the UNHCR on Wednesday, there is no gainsaying that a bigger responsibility lies with the Government. It is imperative that the Government ensures transparency and an on-going dialogue with the public by telling its stories as they are for two important reasons. One is to carry the people along with the Government in all the initiatives. The other, even more importantly, to marginalise those who may want to disrupt the process for political reasons. Even if such a step is bitter, they would be wiser to win public confidence than leave the task to spin masters to doctor and engineer events.